Michael Pollan will be in Chicago on Monday, May 18, to discuss and sign copies of his new book, "In Defense of Food: An Eater's Manifesto." The lecture will take place at 6 pm in the Cindy Pritzker Auditorium, Lower Level, at The Harold Washington Library Center, 400 South State Street. There's no fee. Food. There's plenty of it around, and we all love to eat it. So why should anyone need to defend it? Here's what Michael says on the books website. Because most of what we're consuming today is not food, and how we're consuming it -- in the car, in front of the TV, and increasingly alone -- is not really eating. Instead of food, we're consuming "edible food like substances" -- no longer the products of nature but of food science. Many of them come packaged with health claims that should be our first clue they are anything but healthy. In the so-called Western diet, food has been replaced by nutrients, and common sense by confusion. The result is what Michael Pollan calls the American paradox: The more we worry about nutrition, the less healthy we seem to become. But if real food -- the sort of food our great grandmothers would recognize as food -- stands in need of defense, from whom does it need defending? From the food industry on one side and nutritional science on the other. Both stand to gain much from widespread confusion about what to eat, a question that for most of human history people have been able to answer without expert help. Yet the professionalization of eating has failed to make Americans healthier. Thirty years of official nutritional advice has only made us sicker and fatter while ruining countless numbers of meals. Pollan proposes a new (and very old) answer to the question of what we should eat that comes down to seven simple but liberating words: Eat food. Not too much. Mostly plants. By urging us to once again eat food, he challenges the prevailing nutrient-by-nutrient approach -- what he calls nutritionism -- and proposes an alternative way of eating that is informed by the traditions and ecology of real, well-grown, unprocessed food. Our personal health, he argues, cannot be divorced from the health of the food chains of which we are part. In Defense of Food shows us how, despite the daunting dietary landscape Americans confront in the modern supermarket, we can escape the Western diet and, by doing so, most of the chronic diseases that diet causes. We can relearn which foods are healthy, develop simple ways to moderate our appetites, and return eating to its proper context -- out of the car and back to the table. 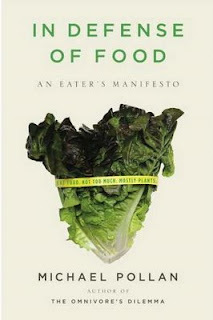 Michael Pollan's bracing and eloquent manifesto shows us how we can start making thoughtful food choices that will enrich our lives, enlarge our sense of what it means to be healthy, and bring pleasure back to eating. Pollan's last book, The Omnivore's Dilemma, launched a national conversation about the American way of eating; now In Defense of Food shows us how to change it, one meal at a time. Trying to make weekend plans on a slim wallet? Head to Birch River Grill (75 W. Algonquin Rd., Arlington Heights; 847-427-4242) which offers a three-course prix-fixe weekend special in addition to the restaurant's regular menu April 24, 25 and 26. For starters, choose either the BRG House Salad or the Soup of the Day. From there, choose between: Surf-n-Turf, petite filet mignon and twin peppercorn bacon-wrapped BBQ glazed shrimp, Yukon gold mashed potatoes, red wine glace and steamed broccolini; Pan Roasted Chicken Breast, spring vegetable ragout, oven roasted gold potatoes and natural jus; or Cedar Planked Maple Salmon, maple rosemary garlic glaze and smoked pepper bacon wild rice pilaf. Enjoy Berry Sorbet, served with fresh berries, as a dessert. At just $20 per person, not only will stomachs appreciate it, but so will wallets. Reservations are recommended; call (847) 427-4242. Birch River Grill offers its signature Mother’s Day brunch buffet from 10 a.m. until 3 p.m. Sunday, May 10. At just $29.95 per person and $13.95 for children under 12, this brunch offers several different stations. Stop by the Seafood Station, to enjoy oysters and cocktail shrimp. Then move on to the Salad Station, where the Chopped Salad, Caesar Salad and Farfalle Pasta salad await. The Continental Station includes assorted fresh breads, muffins, croissants, bagels, and fresh fruit; Egg & Omelet Station offers eggs and omelets made to order, sausage, bacon, potatoes O’Brien, pancakes and French toast; Carving Station has turkey with cranberry sauce and beef tenderloin with red wine demi glaze; and Hot Buffet Station includes broiled tilapia provencal and lemon chicken oreganato. Then, choose from a variety of vegetables, pastas and desserts. Birch River Grill welcomes warm weather with the restaurant’s new spring menu, featuring old favorites like Wild Game Chili, grilled tender bison ranch sirloin, Broadleaf Farms wild boar, andouille sausage, smoky tomato sauce and heirloom beans ($6/$9); Meatloaf Tower, ground beef, veal, pork, crispy haystack onions, Yukon Gold mash and roasted tomato glaze ($15); and the Rushing Waters Wisconsin Rainbow Trout, teardrop tomato relish, sautéed spinach and Yukon Gold mashed potatoes ($18). Sample new starters, including the BBQ Shrimp & Grits, peppercorn bacon wrapped shrimp, white cheddar cheese grits and a BBQ glaze ($11). Try the new Citrus Spinach Salad, baby spinach leaves, Mandarin orange supreme, avocado, julienne red onion, diced roasted red bell pepper, citrus vinaigrette dressing ($10; with grilled chicken, $12; with rock shrimp, $14). New sandwiches include the Vegetable Wrap, sun-dried tomato wrap, basil mayo, portobello mushroom, roasted red and green peppers, diced tomato, avocado and baby spinach ($9); Smoked Turkey Wrap, whole wheat wrap, sliced smoked turkey breast, orange cranberry herb mayonnaise, peppercorn bacon, lettuce, tomato and sweet potato fries ($9); and Hot Beef-n-Cheese, shaved roast beef, Havarti cheese, horseradish sauce, shredded lettuce, sliced tomato, toasted Bavarian pretzel bun and hand cut fries ($10). Birch River Grill’s spring menu features wine pairings with each entrée. Try new entrées like Smoky BBQ Ribs, jalapeno corn bread, sweet potato fries and horseradish slaw ($16/24), paired with THE ZIN 2006 Zinfandel, Calif.; and Sun-dried Tomato & Gorgonzola Ravioli, tomato tarragon broth, basil pesto, teardrop tomatoes and crispy basil ($13), paired with Montevina Pinot Grigio, Calif.
For the sweet tooth, try Birch River Grill’s new desserts, including Triple Chocolate Column for Two, moist bittersweet chocolate cake, chocolate cream cheese frosting and hot fudge ($9); Wild Berry Cheesecake, strawberry sauce and fresh berries ($6); and Lavendar Apricot Panna Cotta, lavender scented vanilla custard, apricot glaze and almond biscotti ($6). Birch River Grill – An American Kitchen is open for breakfast, lunch and dinner seven days a week, 6 a.m. to 10 p.m. Monday through Thursday; 6 a.m. to 11 p.m. Friday; 7 a.m. to 11 p.m. Saturday; and 7 a.m. to 10 p.m. Sunday. The lounge stays open one hour later daily. All major credit cards are accepted. Complimentary parking is available. For reservations or more information, please contact Birch River Grill – An American Kitchen at (847) 427-4242 or visit them on the web at www.birchrivergrill.com. Enjoy Mother’s Day brunch at the West Loop’s retro-chic Dine, 9:30 a.m. until 4 p.m. Sunday, May 10. Enjoy the Seafood, Soup & Salad Station, featuring an array of salads, an antipasto display with sliced rustic breads, sweet corn and seafood bisque and a ceviche bar. Meat lovers will enjoy the Carving Station, with roasted beef tenderloin with horseradish sauce and caramelized onions, silver dollar rolls and roasted garlic and creamed spinach. The Entrée Station features many items, including crusted salmon with a shallot butter sauce, Portobello pasta caprese, roasted chicken breast and Dine’s signature meatloaf with garlic mashed potatoes. Wake up with Dine’s Breakfast Station, featuring made to order omelets, scrambled eggs, hash browns, bacon, sausage, pastries and brioche French toast. Finally, indulge in the pastries, sweets and red velvet cupcakes from the Dessert Table. On Mother’s Day, every mother receives a complimentary rose. Dine’s brunch is $39 per person, $15 for children 12 and under and no cost for children under five. The restaurant opens for regular dinner at 5 p.m.
Sip Dine’s new spring martinis, each featuring sweet fruits to welcome springtime. Try Spring Fling, Absolut mango, DeKuyper sour apple pucker and cranberry juice ($11); Swellin’ Melon, Stoli vanilla, melon pucker, white cranberry juice and splash of orange juice ($11); and Blueberry Hill, Stoli blueberry, blue curacao, pineapple juice and white cranberry juice ($11). Dine is open for breakfast, lunch and dinner seven days a week. Breakfast is served 6 a.m. to 11 a.m. Lunch is served 11 a.m. to 5 p.m. daily. Dinner is served 5 p.m. until 10 p.m. Sunday through Thursday, and from 5 p.m. until 11 p.m. Friday and Saturday. The Martini Bar and Lounge is open for dining and drinks until 11 p.m. Sunday through Thursday and until midnight Friday and Saturday. Dining is available at the bar. Valet parking is complimentary. For more information or to make reservations, please contact Dine at (312) 602-2100 or visit www.dinerestaurant.com. 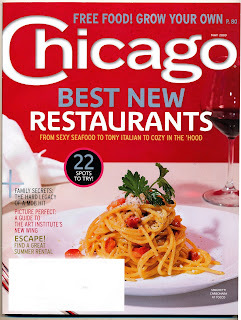 Congratulations to Glen Prairie, just named as one of the 2009 “Best New Restaurants” by Chicago Magazine. The publication commends Glen Prairie’s green-minded artisanal foods, talented chef and friendly staff. Glen Prairie celebrates Mother’s Day with its special Mother’s Day Brunch, offered Sunday, May 10. This extensive buffet includes a Salad Station, with grilled vegetable salad, prairie salad and spinach and berry salad. From the Bakery Station, enjoy assorted house baked breakfast pastries, breads, muffins and artisan rolls. Try Omelets Made to Order, a Farm Fresh Buffet and Chef’s Station. Children will enjoy the Kid’s Corner, with pancakes, Amish chicken nuggets, mac ‘n cheese, French bread pizza and fruit cups. Reservations are required for this Mother’s Day feast, which is $27 for adults, $12 for children ages five through 12 and children four and under are complimentary. Sip Glen Prairie’s Mother’s Day drink specials, including the Motherly Love, blended honeydew melon, Midor Melon Liqueur, Absolut and ice ($8); Rainbow Sherbet, Stoli Raz Vodka, blue curacao, fresh-squeezed orange juice, lime juice, splash of grenadine and sour, garnished with an orange wheel and Maraschino cherries ($8); Drunk Arnie, sweet tea vodka and lemonade, ($7); and Chocolixir, Godiva Milk Chocolate Liqueur and Bailey’s Irish Cream, served on the rocks ($9). Glen Prairie launches new spring menus, beginning with new salads from the lunch menu: Confit Tuna Nicoise Salad, baby greens, kalamata olives, farm fresh eggs, red onion, French beans, fingerling potatoes and Champagne-Cider vinaigrette ($12), and Grilled Iowa Farmed Skirt Steak Salad, baby greens, green onions, organic goat cheese, fresh tomatoes, roasted peppers and truffle vinaigrette ($14). New lunch entrees include: Iowa Farmed Skirt Steak Sandwich, smoked provolone, garlic grilled sourdough, herb relish and caramelized onion ($14); Dietzler Farms Prime Patty Melt, organic Swiss cheese, caramelized onions and toasted marble rye ($11); Glen Prairie’s Grilled Cheese, locally farmed goat cheese, thyme marinated tomatoes and toasted challah ($8); and Roasted Vegetable Plate, slow roasted tomatoes, herb relish and balsamic glaze ($10). For dinner, Glen Prairie introduces new starters, including: Flight of Local Farmers Market Vegetable Crudités, French soy, buttermilk ranch and herb dips ($8); Miller Farms Sage Grilled Chicken Wings, garlic and sweet chili aioli, and organic celery ($7); Grilled Sweet Corn and Tomato Bruschetta, fresh mozzarella and crostini ($8); and Locally Farmed Asparagus, Caw-Caw Creek prosciutto, market mushrooms, peppato cheese and truffle vinaigrette ($8). Glen Prairie’s new dinner items include Spiced Grilled Missouri Catfish, sweet peas, roasted fingerling potatoes and sauce rémoulade ($18); Pappardelle Carbonara, Caw-Caw Creek prosciutto, slow roasted tomatoes and fresh herbs ($16); Local Farmers Market Roasted Vegetable Plate, slow roasted tomatoes, organic goat cheese, basil oil and balsamic glaze ($14); and Baby Eggplant Involtini, roasted garlic ricotta, organic tomato sauce and fresh mozzarella ($16). Indulge in Glen Prairie’s array of new desserts, such as Seasonal Cobbler, fruit cobbler with seasonal fruit ($7); Strawberry, Peaches and Cream Trifle, fresh organic strawberries, Cointreau marinated peaches, mascarpone cream and moist pound cake (regular $7; mini $2); Heavenly Brownie Sundae, house made chocolate brownie, vanilla bean gelato, chocolate sauce and cocoa nibs (regular $6; mini $2); and Fruit and Berry Plate, seasonal organic fresh fruit and berries with organic whipped cream ($5). Glen Prairie Local Flavor Fine Food & Drink is located at 1250 Roosevelt Rd. in Glen Ellyn, Ill. in Chicago’s western suburbs. Glen Prairie is open 6 a.m. until 10 p.m. Monday through Thursday, 6 a.m. to 11 p.m. Friday, 7 a.m. to 11 p.m. Saturday and 7 a.m. until 10 p.m. Sunday. The lounge remains open one hour later than the restaurant each day. For more details, contact the restaurant at (630) 613-1250 or visit www.glenprairie.com. Mothers and grandmothers receive a complimentary glass of Champagne during Karma’s Mother’s Day celebration, offered 10 a.m. until 4 p.m. Sunday, May 10. The brunch buffet features different stations, including the Salad Station; Seafood Station, with citrus poached King Salmon, peel-and-eat shrimp and Creole Bay Seafood salad; Made to Order Omelet Station; Breakfast Station, including ginger French toast, cheese blintzes with fruit compote, pepper cured bacon, country sausage links and breakfast potatoes; Savory Station, with roasted chipotle chicken, Asian BBQ salmon with sautéed vegetables, Dijon mustard and rosemary pork loin over pesto risotto; Carving Station, with herb and garlic crusted prime rib and honey baked ham; and Desserts, including assorted mini French pastries and bakery fresh tortes and pies. Mother’s Day brunch at Karma is $26.95 for adults, $12.95 for kids 12 and under and no cost for children under five. Karma’s spring menu features new seasonal entrees. Try Shaolin Grilled NY Strip, baby vegetables, shoestring potatoes, drizzled with mustard aioli and spicy tamari demi glace ($28); Shanghai Glazed Rib-eye, 14 oz. bone-in center cut steak served with a Shanghai sauce and garlic chive mashed potatoes ($27); Asian BBQ Salmon, forbidden rice, sweet potato crisps, wok-tossed spinach, Napa cabbage and shiitake mushroom ($19); and Yellow Mango Vegetable Curry, spring vegetables tossed with coconut yellow curry, jasmine rice and kimchee ($15). Karma also celebrates National Sake Month (April) by offering the Hakutsuru Junmai sake, normally $11, on special for only $7 throughout the month of April. Reservations are recommended. Karma is open seven days a week 6:30 a.m.-10:30 a.m. for breakfast; 11:30 a.m.-2 p.m. for lunch; 5 p.m.-10 p.m. Sunday through Thursday for dinner, and 5 p.m.-11 p.m. Friday and Saturday for dinner. 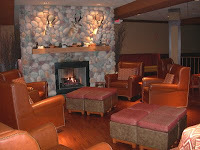 The lounge is open 5 p.m.-11 p.m. Sunday through Thursday; and 5 p.m. – midnight Friday and Saturday. Karma is located adjacent to the Crowne Plaza Chicago North Shore at 510 E. Route 83, Mundelein, Ill. For reservations or more information, call Karma at (847) 970-6900 or visit www.karmachicago.com. 500 N. Kingsbury St., Chicago, Ill. Celebrate Mother’s Day brunch in the family-friendly setting of Maxwell’s at the Club, the recently renovated, open-to-the-public restaurant located in Chicago’s East Bank Club. Browse the brunch buffet 10 a.m. until 2 p.m. on Mother’s Day, Sunday, May 10. The first station includes Shrimp Cocktail; Chilled Poached and Roasted Salmon; Lox with cream cheese; Toasted Bagels; Seasonal Fresh Fruit; and much more. At the second station, try a variety of salads, including Mesclun Greens, Lemon Scented Quinoa Salad, Kamut Salad, with wild rice and cranberry salad; Roasted Potato Salad; Asian Shrimp and Edamame Salad; and more. The carving station includes Roast Prime Rib of Beef, with au jus and horseradish sauce, and Roast Rack of Lamb, with mint jelly and mint-Dijon sauce. The final station features breakfast items, including Applewood Smoked Bacon and Sausage; Breakfast Potatoes; Eggs Benedict; French Toasted Cinnamon Brioche with bananas; Santa Fe Chicken and Tortilla Casserole; Waffle and Omelet bar; and more. Enjoy assorted breakfast pastries and desserts. The Mother’s Day brunch menu at Maxwell’s is $45 per person, and $15 for children under 10. Maxwell’s also hosts a special Mother’s Day dinner buffet, offered 4 p.m. until 6:30 p.m. Sunday, May 10. The first station includes Shrimp Cocktail; Chilled Poached and Roasted Salmon; Lox with cream cheese; Toasted Bagels; Seasonal Fresh Fruit; and much more. At the second station, try a variety of salads, including Mesclun Greens; Lemon Scented Quinoa Salad; Kamut Salad; Roasted Potato Salad; Asian Shrimp and Edamame Salad; and more. At the carving station, try Roast Prime Rib of Beef, with au jus and horseradish sauce, and Roast Rack of Lamb, with mint jelly and mint-Dijon sauce. Finally, enjoy Texas Rub Roast Pork with bourbon BBQ sauce; Roasted Halibut with tomato basil sauce; Herb Roasted Lemon Oregano Chicken; Soy-Ginger Tuna with lo mein noodles and vegetables; Roasted Red and Sweet Potatoes; Chicken Skillet with broccoli, mushrooms, onions, peppers and tomatoes; Sauteed Green Beans with wild mushrooms; and Sauteed Baby Vegetables. Try the Pasta Station, with assorted pasta, vegetables and sauce. For the sweet tooth, stop by the Assorted Desserts. The Mother’s Day dinner menu at Maxwell’s is $45 per person, and $15 for children under 10. Maxwell’s at the Club is located in Chicago’s East Bank Club (500 N. Kingsbury St., 312-527-5800, Ext. 301). Maxwell’s is open weekdays 11:30 a.m.-2:30 p.m. for lunch and 5:30 p.m.-9:30 p.m. for dinner. The bar and lounge is open 11:30 a.m.-9:30 p.m. Monday through Friday. Sunday brunch is served every week, 10 a.m.-2 p.m. Reservations for special holiday menus and events are strongly recommended. For more information visit online at www.eastbankclub.com. Join Restaurant Michael for the restaurant’s special Mother’s Day brunch, offered Sunday, May 10 from 11 a.m. until 2:30 p.m. Brunch is $39 per person, $19 per child 12 and under and complimentary for children three and under. Also on Mother’s Day, join Restaurant Michael for a special dinner, 4:30 until 8:30 p.m. The dinner is $49 per person, $25 for children twelve and under, and no cost for children three and under. Prices listed above do not include tax and gratuity, and reservations are required. The brunch begins with a choice of Sliced House Cured Smoked Salmon on warm potato cake, with chive and lemongrass crème fraiche; Tian of Roasted Portabella Mushroom, Laura Chenel Goat Cheese and basil, with toasted pine nuts and tangerine vinaigrette; Carpaccio of Beef Tenderloin, and Big Eye Tuna “Nicoise” Petite Mache Salade in a Romano cheese cage; Steamed Zucchini Blossoms filled with veal and truffle mousse, with sauce Perigord; or a Classic Salade Lyonnaise, warmed poached eggs, lardons of bacon, croutons and baby frisée, with a Champagne herb vinaigrette. Then, choose between French Rolled Omelet with a choice of smoked salmon, chive scented mascarpone cheese, confit tomato, or grilled red onion, served with crispy bacon, potato cake and warm toasted brioche; Poached Eggs “Homardine” over toasted brioche croutons topped with lobster raviolis and sautéed spinach, Nantua sauce and thin asparagus spears; Pan Roasted White Fish with crispy Anna potatoes, baby French green beans and caper lemon butter; Grilled Flat Iron Steak served “Marchand de Vin,” with gratin potatoes with a rich Pinot Noir and shallot reduction; or Exotic Mushroom Crepes with rosemary scented morel cream and silky carrot mousse. For dessert, indulge in either Fresh Seasonal Fruit Tart, with grilled stone fruit sorbet; Bittersweet Valrhona Chocolate Crepe with candied banana and dark rum gelato; or White Chocolate Semifreddo with rosemary kissed berries. Restaurant Michael is open for dinner Monday through Thursday from 5:30 p.m. until 10:30 p.m., Friday and Saturday from 5:30 p.m. until 11:30 p.m., and Sunday from 4:30 p.m. until 9:30 p.m. The restaurant is open for lunch Friday from 11 a.m. until 2 p.m. Restaurant Michael is available for private functions on and off site. Call (847) 441-3100 or visit www.restaurantmichael.com for more information. 921 Pasquinelli Dr., Westmont, Ill. Celebrate a family-friendly Mother’s Day at Pappadeaux Seafood Kitchen’s Westmont location, 10 a.m. until 10.m., open one hour earlier from its regular time. Enjoy favorites from the restaurant’s regular menu, including Hazelnut Crusted Ecuadorian Tilapia Fillet, topped with shrimp and garden ripe tomatoes in a light white wine sauce with fresh green beans ($19.95); New Orleans Jazz Scallops, tender jumbo sea scallops with fresh ginger butter, served with fresh green beans and spaghetti squash ($19.95); and Blackened Catfish Opelousas, with oysters, shrimp and crabmeat in a lemon garlic butter sauce with dirty rice ($22.95). Sample a variety of seafood flavors with the Pappadeaux Platter, fried shrimp, fried oysters, fried Mississippi catfish fillet, fried crawfish, stuffed shrimp and stuffed crab on a bed of seasoned French fries ($26.95). Children can enjoy the balloon artist and clown, while the whole family can dine to the jazz tunes of Dixieland Express, playing all day Mother’s Day. 798 W. Algonquin Rd., Arlington Heights, Ill.
At Pappadeaux Seafood Kitchen’s Arlington Heights location, celebrate Mother’s Day with the $19.95 per person, all-you-can-eat brunch buffet, offered 9 a.m. until 3 p.m., with the regular menu also available. Following brunch, join Pappadeaux for dinner 3 p.m. until 9 p.m. Enjoy different stations, including a Carving Station, with ham, prime rib and lamb, as well as the Made to Order Station, with omelets, pancakes and waffles. Dine to the sounds of jazz pianist Timothy Hardin, while children’s fun includes a balloon artist. Both the Westmont and Arlington Heights Pappadeaux locations recently launched an all-new lunch menu with unbelievable deals, served daily 11 a.m. until 3 p.m. New soup, salad and sandwich items include: Crispy Grouper Sandwich, fresh Florida grouper battered and fried crisp on a French bread bun with cocktail and tartar sauce, crisp slaw and red onion ($9.95); Pappadeaux Steak Sandwich, grilled rib eye steak served on a French bread bun with horseradish mayonnaise, grilled onions, tomato and arugula ($12.95); and Louisiana Gumbo & Poboy, choice of half blackened catfish, fried shrimp or fried oyster poboy and a cup of gumbo or crawfish bisque ($8.95). New fresh fish include the Ginger Salmon, grilled salmon fillet topped with ginger butter and served with almond green beans ($10.95); Seared Grouper Scampi Style, blackened Florida grouper with crispy garlic and lemon garlic butter, with sautéed zucchini ribbons ($11.95); and Pan Grilled Tilapia, topped with toasted hazelnuts and brown butter served with green beans and potatoes ($9.95). Try the new pasta dish, Creamy Parmesan Pasta, linguine tossed with zucchini, mushrooms and herbs in a creamy parmesan sauce, topped with grilled chicken breast ($9.95); and sample the new specialty salad, Pappadeaux Salad, signature salad of spinach, romaine and herbs tossed in a chili lime vinaigrette with fresh jicama, cucumber, peanuts and avocado, finished with a choice of sweet and spicy glazed beef filet tips, grilled shrimp or grilled chicken breast ($10.95). Pappadeaux Seafood Kitchen is open for lunch and dinner seven days a week. Both the Westmont and Arlington Heights locations offer private function space and events. For more information, call the Westmont location at (630) 455-9846, or call the Arlington Heights location at (847) 228-9551. Visit online at www.pappadeaux.com. 601 N. Milwaukee Ave., Wheeling, Ill.
Join the popular north shore eatery, Tramonto’s Steak and Seafood, on Sunday, May 10 for the restaurant’s Mother’s Day brunch buffet, offered from 10 a.m. until 3 p.m. in the space adjacent to the restaurant. As a special treat, each mother receives a complimentary $25 gift certificate to Tramonto’s Steak and Seafood. At the Mother’s Day brunch, enjoy a variety of hot breakfast fare, including sausage, bacon, breakfast pastries and pancakes. Get made to order omelets at the Omelet Station, and for the lighter side, enjoy assorted salads, pastas, chicken, fish and shrimp cocktail. Savor roast beef with horseradish cream, and turkey breast with turkey giblet gravy at the Carving Station. Indulge in the treats at the Dessert Station, and sip complimentary cocktails at the Mimosa Bar and the Bloody Mary Bar. The Mother’s Day brunch buffet at Tramonto’s Steak and Seafood is $39.95 per person and $13.95 for children 12 and under. Enjoy Tramonto’s regular breakfast buffet, offered from 7 a.m. until 10 a.m. After brunch, stay for the restaurant’s regular dinner menu, offered from 3 p.m. until 8 p.m.
Tramonto’s Steak & Seafood is located adjacent to the Westin Chicago North Shore Hotel, 601 N. Milwaukee Ave., Wheeling, Ill. (847) 777-6575. Hours: Breakfast: 6 a.m. to 11 a.m. Monday through Friday; 7 a.m. to 11 a.m. Saturday and Sunday; Lunch: 11 a.m. to 3 p.m. Limited Lunch: 3 p.m. to 5 p.m. Dinner: 5 p.m. to 10 p.m. Monday through Thursday; 5 p.m. to 11 p.m. Friday and Saturday, and 4 p.m. to 9 p.m. on Sunday. For more information or to make reservations, call (847) 777-6575. Don’t forget to celebrate Mother’s Day with ASLF. One donation can purchase a breast cancer screening mammogram for a woman through ASLF’s Buy A Mom A Mammogram™ program. Buy A Mom A Mammogram™ funds no cost screening mammograms and follow up diagnostic testing when indicated to uninsured and underinsured individuals in a timely, dignified and respectful fashion. ASLF has provided 3,000 individuals with information about and access to no cost mammograms. To donate, call ASLF at (312) 345-1322 or visit www.asilverliningfoundation.org. Find dining deals this weekend at one of Chicago Magazine's Best New Restaurants, Glen Prairie (1250 Roosevelt Rd., Glen Ellyn; 630-613-1250). Chef Daniel Ovanin offers two special dishes in addition to the local food-focused resto's regular menu April 17, 18 and 19. Try Dakota Farmed Bison Strip Steak, roasted red pepper potato puree, grilled ratatouille and truffle herb butter ($28); or try Seared Great Lakes Striped Bass, Minnesota wild rice, roasted tomato and black olive tapenade ($22). Wine pairing specials are also available all weekend long. For reservations and more information, call (630) 613-1250 or visit http://www.glenprairie.com/. Don't forget to celebrate Earth Day at Glen Prairie. The management and staff at Glen Prairie are committed to demonstrating sustainable living through energy and resource conservation. That's why on Earth Day (April 22), the restaurant will turn off or dim any non-essential lighting, set the cooling system temperature in publica areas at 72 degrees and make additional efforts wherever possible with staff to create awareness of sustainability. For more information about Earth Day, visit http://www.earthday.net/. Looking for tax day relief? Search no further than Chicago's River North neighborhood for extensive deals and steals. Recently, 14 participating businesses started distributing special "We Mean Business in River North" buttons in conjunction with the River North Business Association (RNBA) (222 Merchandise Mart Plaza, 312-645-1047), which will provide customers with discounts at area businesses on designated RNBA Days throughout the year, the first of which is tomorrow, Wednesday, April 15. There is no cost for the button, but customers wearing them will have many benefits including discounts at participating RNBA member restaurants and retail stores, as well as business services including accounting, legal, public relations, graphic design, advertising and other service oriented business that call River North home. Customers taking advantage of the discount program need not be a member of the RNBA. Those businesses that choose to participate in the button program, will display a poster in their store window or office to their customers. The buttons will continue to be used for various discounts and promotions by RNBA members throughout the year. "We've introduced the 'We Mean Business in River North' button program as a way to help promote the new name of the River North Business Association, as well as a new approach to bring in potential customers and clients to our members," says RNBA Executive Director, Sharon Romack. RNBA, formerly the River North Association, underwent a name change last month.Businesses Participating in "We Mean Business in River North" Button Program April 15. The Anti-Cruelty Society (157 W. Grand Ave.; 312-644-8338) allows customers to come and receive a free gift if they come in furnishing a button. Argo Tea's location at the Merchandise Mart (222 Merchandise Mart Plaza; 312-553-1550) is giving customers 20% off drinks with every purchase. 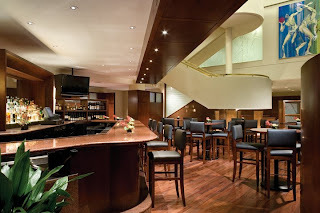 Embassy Suites Downtown Chicago (600 N. State St.; 312-943-3800) is giving customers 10% off any catered event with any new contract signed after March 26. Fireside Collection (200 W. Ohio St.; 312-587-7587) is giving a 10% discount off any showroom items.Gilda's Club (537 N. Wells St.; 312-464-9900) is giving a free cup of Argo Tea. The Holiday Inn Chicago Mart Plaza (350 W. Mart Center Dr.; 312-222-9508) is giving a 15% discount off food purchases at Italiasia, a restaurant located within the hotel. Kurman Communications, Inc. (345 N. Canal St. Suite 1404; 312-651-9000) is giving a complimentary telephone consultation and $500 off first month's retainer or project fee. Lightology (215 W. Chicago Ave.; 312-944-1000) is giving 30% off list prices. North Bank customers will receive a service-free checking account for one year from North Bank (360 E. Ohio St.; 312-644-4000) if wearing a button. Park Rental Residences (320 W. Illinois; 312-321-3200) is giving half off the move in fee at the time of application when leasing an apartment; a $200 value. P.A.C.E. (446 N. Wells St., Suite 2000; 773-604-1717) is giving customers 50% off membership. PhysioLife Studios (712 N. Dearborn St., 3rd Floor; 312-255-8308) is giving customers $50 off any personal strength training package and/or nutrition services. Customers must schedule a free consultation and trial session on the designated button date in order to redeem the discount. The Redhead Piano Bar (16 W. Ontario St.; 312-640-1000) is giving customers 20% off their total bill when they come in wearing a button. State Street Bread Co. (30 E. Hubbard St.; 312-595-0766) is giving 20% off all food purchases. However, if a customer has already received the discount, they will get a special gift instead. Thrive Integrative Medical Spa (875 N. Dearborn, 3rd Floor; 312-932-9500) is giving customers various discounts on services. The perks include $50 off BOTOX and fillers; a $55 Introductory Microdermabrasion; $199 off a full face Photofacia; and receive a complimentary underarm treatment with the purchase a bikini laser hair removal. Zocalo (358 W. Ontario St., 312-302-9977) is giving $25 off a dinner bill exceeding $75 or more. 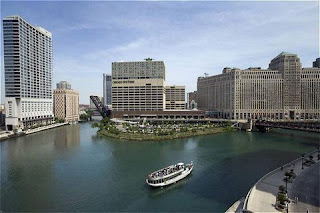 About River North Business Association:The River North Association was founded in 1981 and quickly became a force in the community, representing businesses and providing member services to help them succeed. The organization recently changed its name to the River North Business Association, but maintains the mission and ideals of which it was founded. The RNBA hopes to preserve a community environment that will provide a high quality of life for all who live, work and visit River North. For more informationon the participating businesses and their discount offers, visit http://www.rivernorthassociation/ or call (312) 645-1047. Searching for a weekend dining deal? Look no further than pan-Asian eatery Karma (510 E. Route 83, Mundelein; 847-970-6900), which offers a special three-course prix fixe menu April 10 through April 12, in addition to the restaurant's regular menu. The soothing sounds of the reflecting pool will serenade diners as they enjoy the starters, a choice of Miso Soup, tofu, sauteed shiitake mushrooms, scallions and roasted nori, or Karma House Salad, crisp lettuce, Napa cabbage, cucumber, daikon and carrot ginger dressing. For the entree, choose between Orange Peel Tempura Chicken, sesame jasmine rice, ginger chili cucumber salad and yuzu orange glaze; Thai Chili Beef, stir fried spiced beef tenderloin with Chinese noodles and baby bok choy, in mirin-miso beef broth; or Yellow Mango Vegetable Curry, spring vegetables tossed with coconut yellow curry, jasmine rice and kimchi. End the meal with a sweet dessert of Daily Selection of Ice Cream or Sorbet, served with fresh berries. At only $25 per person, this is a perfect weekend dining deal. For reservations or more information, call (847) 970-6900 or visit http://www.karmachicago.com/. Rick Hall, head chef of Maxwell's at the Club and executive sous chef of East Bank Club, made his national debut today on WGN TV's Midday news. Chef Hall spoke with WGN anchor Robert Jordan about traditional Passover dishes, all of which are part of Maxwell's special Seder dinner tonight, April 8, 5:30 p.m.-9:30 p.m.
Jordan helped mix and saute ingredients for a Baked Halibut in a "Spice Trade" Tomato Sauce while Chef Hall showed off other dishes, including Zucchini Potato Pancakes, Braised Beef Brisket with fresh vegetables and traditional Passover favorite, Gefilte Fish. Guests of Maxwell's special dinner tonight will each also receive a Seder Plate and Haggadah to remember the Jews' exodus and liberation of slavery from Egypt. Maxwell's at the Club is located at 500 N. Kingsbury St. inside Chicago's East Bank Club. The restaurant is open to the public weekdays for lunch and dinner, and Sundays for brunch. 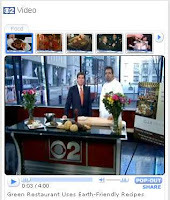 For more information abou the restaurant call (312) 527-5800, Ext. 301 or visit online at www.eastbankclub.com. Greenberg filmed, edited and directed the video, "Air Yeezy, Beyond the Hype", which was posted on YouTube.com on Sunday, April 5. According to Greenberg, the video has already gained 30,000 hits and this number is increasing by 1,000 hits per hour. Greenberg teamed up with local hip hop music producers Lewis Walker and Q-Beans, who produced the soundtrack. The Kanye West shoes, gray shoes with fuchsia and orange highlights, are already a collector’s item. Only about 220 pairs, in total, were available in six Chicago stores: Niketown, House of Hoops, Succezz, Leaders 1354, Saint Alfred, Self Conscious. This is a one-time run. No additional pairs in this color will be available. A different color will be offered in May and another in June. The shoes' list price is $215, but they are already being re-sold on ebay.com for at least $1,200. Last week, 14 participating businesses started distributing special "We Mean Business in River North" buttons in conjunction with the River North Business Association (RNBA) (222 Merchandise Mart Plaza, 312-645-1047), which will provide customers with discounts at area businesses on designated RNBA Days throughout the year, the first of which is Wednesday, April 15. "We've introduced the 'We Mean Business in River North' button program as a way to help promote the new name of the River North Business Association, as well as a new approach to bring in potential customers and clients to our members," says RNBA Executive Director, Sharon Romack. RNBA, formerly the River North Association, underwent a name change last month. Fireside Collection (200 W. Ohio St.; 312-587-7587) is giving a 10% discount off any showroom items. Gilda's Club (537 N. Wells St.; 312-464-9900) is giving a free cup of Argo Tea. Zolaco (358 W. Ontario St., 312-302-9977) is giving $25 off a dinner bill exceeding $75 or more. The River North Association was founded in 1981 and quickly became a force in the community, representing businesses and providing member services to help them succeed. The organization recently changed its name to the River North Business Association, but maintains the mission and ideals of which it was founded. The RNBA hopes to preserve a community environment that will provide a high quality of life for all who live, work and visit River North. For more informationon the participating businesses and their discount offers, visit http://www.rivernorthassociation/ or call (312) 645-1047. Kick off Spring with family and friends at A Silver Lining Foundation's Community Outreach Health Fair, from 10 a.m. until 2 p.m. Saturday, May 9 at George Washington High School (3535 E. 114th St., Chicago). At the event, receive free health testing for the whole family, health information, food, a special children's health area, and pre-qualify for no-cost mammograms. For more information, call A Silver Lining Foundation at (312) 345-1322 or visit http://www.asilverliningfoundation.org/. A Silver Lining Foundation (ASLF) has teamed up with Gregg Helfer, Ltd., private jeweler in Chicago. 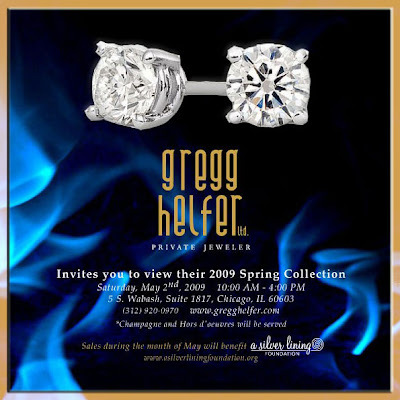 The store invites you to view their 2009 Spring Collection from 10 a.m. until 4 p.m. Saturday, May 2 at Gregg Helfer, Ltd. (5 S. Wabash, Suite 1817, Chicago; 312-920-0970). Meet NBC5 personality and ASLF founder Dr. Sandy Goldberg, and enjoy champagne and hors d'oeuvres at this unique event. A portion of sales during the month of May will benefit A Silver Lining Foundation. For more information, visit http://www.gregghelfer.com/ or http://www.asilverliningfoundation.org/. Head to Glen Prairie (1250 Roosevelt Rd., Glen Ellyn; 630-613-1250) for three weekend specials, offered in addition to the environmentally-conscious restaurant's regular menu, April 3 through 5. Try Pan Seared Pheasant, roasted beet risotto and baby carrots ($25); Grilled Atlantic Salmon, fork smashed fingerling potatoes, lemon-dill sauce and organic spinache ($22); or Roasted Alaskan Halibut, grilled southern Illinois ramps, haricot verts and fire roasted red pepper vinaigrette. Wine pairing specials are also availabled. Make a reservation by calling (630) 613-1250 or visiting http://www.glenprairie.com/. Looking for a weekend dining deal? Birch River Grill (75 W. Algonquin Rd., Arlington Heights; 847-427-4242) offers a special three course meal for just $20 per person, in addition to the restaurant's regular menu, April 3 through April 5. Begin with Birch River Grill's House Salad or Soup of the Day. For the main course, choose between Broasted Chicken, creamy cole slaw and hand cut sweet potato fries; Smokey BBQ Ribs, 1/2 slab baby back ribs, jalapeno corn bread, sweet potato fries and horseradish slaw; or Sundried Tomato & Gorgonzola Ravioli, tomato tarragon broth, basil pesto, teardrop tomatoes and crispy basil. Finally, indulge the sweet tooth for dessert with the Berry Sorbet. Reservations are recommended for these weekend dining deals. Call (847) 427-4242 or visit http://www.birchrivergrill.com/. Maxwell's at the Club, East Bank Club's contemporary American restaurant, is featured in today's Weekend Journal cover story of The Wall Street Journal. The story, by Katy McLaughlin and Juliet Chung, talks about the steps restaurant bars are taking to help drive business in the down economy. Maxwell's, which re-opened after remodeling last October, has added more cocktail tables and a 52-inch plasma TV to its bar area, plus two more nights of live music (now Tuesday through Thursday). The story goes on to mention the six special martinis Maxwell's added to its bar menu, including one with lychee liquor and sake. The restaurant also occasionally sends over complimentary pizzas or shrimp cocktail to patrons in the bar area to help promote the food in the dining room. 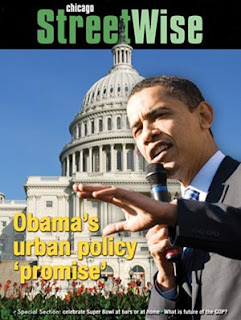 The cover story can be ready in its entirety here. Maxwell's at the Club (500 N. Kingsbury St.; 312-527-5800, Ext. 301) is open for lunch and dinner Monday through Friday, and brunch on Sunday. For the holidays, the restaurant is hosting a special Passover dinner Wednesday, April 8 and Easter brunch Sunday, April 12. To learn more, tune in to the 10 a.m. news on CBS 2 this Sunday, April 5 to see Head Chef, Rick Hall demonstrate special Maxwell's recipes.